In previous article we learn how to do Half Wheel Pose. Today we will talk about Full Wheel pose or 'Chakrasana' - How to do it, Steps, Benefits, Variations and Precautions of it. Chakrasana is also known as "Wheel Pose" or "Full Wheel Pose". Chakrasana is the combination of 2 Sanskrit words, 'Chakra' + 'Asana'. Where, Chakra means 'Wheel', and Asana mean 'Pose'. This Yoga pose also called as 'Urdva Dhanurasana' or 'Upward Bow Pose'. Chakrasana is backbend yoga pose. Difficulty level - 5 out of 10. This is great asana for full body, you can fill instant energy, freshness immediately after this Yoga pose or asana. How to do Wheel Pose? Lie down on the back, on Yoga Mat in Shavasana or corpse yoga pose. Take couple of deep breath and calm your mind. While breath - in, bend your knees and bring your feet close to buttocks. Make sure that your feet are hip-width apart. While breath - out, bend your elbows and put palms near the shoulder facing floor, fingers pointing towards the feet, as shown in picture above. Now take 1 deep breath-in, inhale and while exhaling slowly raise first your hips / buttocks then back and after head off the floor. Do not stop breathing more than 3 second, while doing this pose (people usually do😟). Your breathing must be gentle. Take slow deep breath, while doing this Yoga pose. Then slowly bring back first your hip then back and after head. This sequence is important. Slowly come to the starting position in Shavasana or corpse yoga pose. You can support your hands or feet on a pair of Yoga Block as shown in image below to help yourself realize the full back-bend. Be sure to brace the blocks against a wall. Your palms must be rest on floor or mat and fingers pointing towards the legs. Do not try to stretch body beyond your capacity. Chakrasana stretches and strengthen legs, buttocks, spine, back muscles, chest, shoulders, arms and wrists etc. In short, this yoga pose, Strengthen total body. This Yoga pose stimulate thyroid and pituitary glands. This yoga pose stretches and strengthen abdomen, lungs and thyroid. Chakrasana Yoga pose cures infertility, asthma, and osteoporosis. This Yoga pose strengthen Kidney, Liver, and Pancreas. This Yoga pose gives a good stretch to your hip flexors, wrist flexors, and core muscles. Chakrasana Yoga pose relieves stress and reduces depression, and makes you feel energetic. Those who have back pain or neck pain also should avoid doing Chakrasana or Wheel pose. If you have a Low or High Blood Pressure, Headache and Insomnia then avoid Chakrasana Yoga Pose. If you are beginner and unable to do Chakrasana Yoga pose, then you can try → Bridge Pose or Setu Bandhasana. Eka Pada Urdhva Dhanurasana is the challenging variation of Chakrasana also known as 'One Legged Wheel Pose'. In this variation, you can lift off one leg from floor. Shift your weight onto one leg and raise another leg, as shown in image below. This Wheel pose variation, increases strength and balance. Eka Hasta Urdhva Dhanurasana is the challenging variation of Chakrasana also known as 'One Armed Wheel Pose' or 'One Hand Wheel Pose'. In this variation, you have to lift off one hand and put it on chest or opposite shoulder. Shift your weight onto 1 hand and another on chest, as shown in below image. 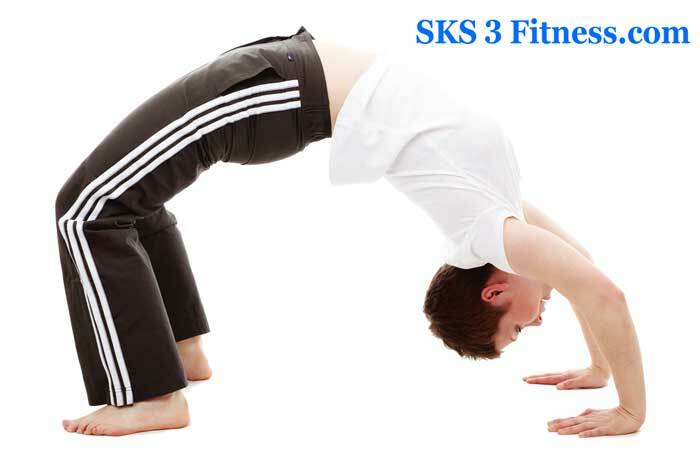 It’s only for advanced flexibility, and regular Yoga practitioner. This Wheel pose variation, increases strength and balance. Dwi Pada Viparita Dandasana is the challenging variation of Chakrasana, also known as 'Forearm Wheel Pose'. In this variation, you have to first rest head on yoga mat, then slowly release rest forearms one by one. Don't rush, do it slowly. It’s only for advanced flexibility, and regular Yoga practitioner. This Wheel pose variation, increases strength and balance. Straight Leg Wheel Pose is the challenging variation of Chakrasana. also known as 'Saral pada chakrasana'. In this variation, you have to straight the both legs when completing all Chakrasana or Wheel pose steps given in this article. Don't rush, do it slowly. It’s only for advanced flexibility, and regular Yoga practitioner. This Wheel pose variation, increases strength and balance.